1. Jo Malone Blackberry & Bay Cologne, $90 for 30mL. This fragrance is inspired by; Childhood memories of blackberry picking… stained lips, sticky palms. A burst of deep, tart blackberry juice, blending with the freshness of just-gathered bay and brambly woods. A vibrant and verdant fragrance. I am yet to try this fragrance but I love how it is inspired by berry picking & of course blackberries which are delicious! It is also available in a 100mL size, as a candle, shower gel & body creme. 2. Viktor & Rolf Flowerbomb Eau de Parfum, $75 for 30mL. This floral explosion releases a profusion of flowers that has the power to make everything seem more positive. Magically evocative notes immediately awaken your deepest senses, giving you the impression of living life in your own secret garden, away from reality. Sambac jasmine, centifolia rose, cattleya orchid, and ballerina freesia bloom on a base of patchouli. This fragrance smells amazing but it seems more of a summer scent to me. I think it'd be great as a candle too. 3. Juicy Couture Viva La Juicy La Fleur Eau de Toilette, $70.00 for 70mL. Viva la Juicy La Fleur is a sheer veil of sparkling mandarin and wild berries, combined with luminous florals of lush honeysuckle, gardenia petals, and soft jasmine. A whisper of creamy gourmand reminiscent of the Classic Viva la Juicy elicits an addiction that envelops the skin. This fragrance has only recently been released in New Zealand so I haven't been able to try it but from the description it seems to be a softer version of the original Viva La Juicy which I love. 4. Marc Jacobs Dot, $95.00 for 30mL. The exuberant top captivates with a delectable blend of red berries, succulent dragonfruit, and sweet honeysuckle. The lush floral heart of the fragrance blooms with the addictive beautiful jasmine, mingled with energizing notes of coconut water and orange blossom. The scent rounds out with a feminine dry down of creamy vanilla, driftwood, and sensual musks. I love this scent! It smells amazing as do most of Marc Jacobs' fragrances. Also, how gorgeous is that bottle? I like this fragrance a lot. 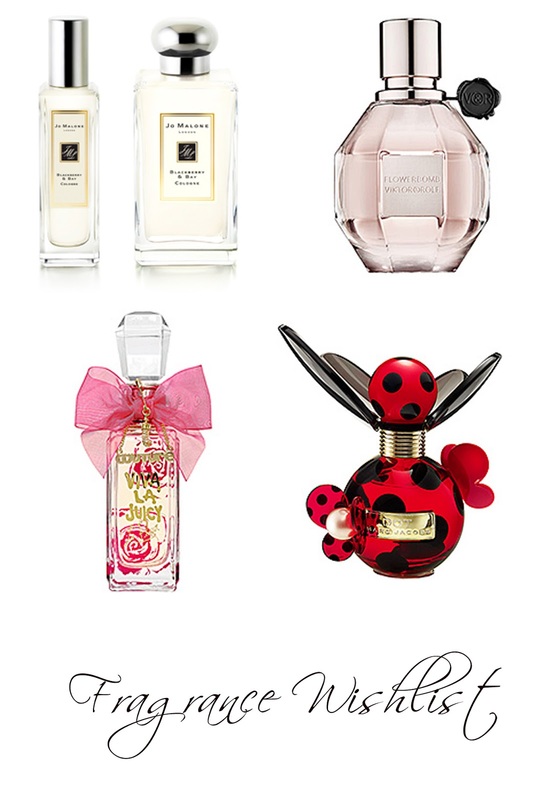 -Have you tried any of these fragrances?? Which is your favourite if you have? *1 is priced in Australian dollars. *2 & 3 are priced in American dollars. I own and wear Flowerbomb and love it - have smelt Dot lately and it was also amazing! eek! I hadn't seen MJ dot before. Daisy and Lola are both long time favourites and that bottle is so cute! Have to hunt it down asap! Flowerbomb is DA BOMB :) I love it!